Â The corrugated fin production line is special equipment for manufacturing sealed and maintenance-free transformer oil tank. Â Main producing process: decoil the material, form plate corrugation, shear and hem corrugated plate, convey and weld corrugation ends edges, weld reinforcing rod, weld fin embossment, bend the finished corrugated fin, assembly corrugated steel tank. Â The base frame of decoiler is welded steel construction, the expandable mandrel is mounted on roller bearings. Expansion and retraction of the mandrel is hydraulically realized. 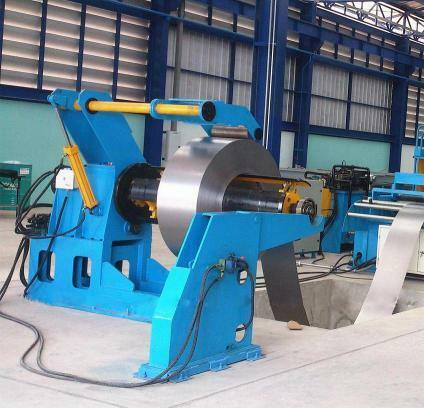 When the steel sheet is automatically fed, a hydraulic motor equipped on the mandrel will function as an auxiliary mechanism for decoiling and partially rewinding the coil. A photoelectrical device composed of 2 photoelectrical switches can sense the sheet hanging between decoiler and corrugation former to control material feeding process. Â The corrugation former consists of steel-welded base, 2-roll feeder, movable forming mold, movable forming pressboard and fixed forming pressboard. It is employed to form the steel corrugation automatically. The corrugation former processed steel sheet using the theory of corrugation extrusion, it is controlled by high accuracy servo system. Hydraulic oil is supplied by hydraulic station. The control system of the former is independent from that of the welding unit. There are 2 quenched pressing bars on both movable forming pressboard and fixed forming pressboard, which are used to press the two ends of corrugation. The position of pressing bars is adjustable according to the width of steel sheet. Reinforcement slots(embossments) can be formed upon customer's request. Â This device is used to shear and hem corrugated steel fins. If the fins with this hemming edge, you can make "corrugated fin tank" more easily, and weld different pieces of corrugated fins into a transformer tank more tightly. Â It consists of lower shearing blade and movable upper shearing blade, which is mounted on a pillar guides. The shear blades are made from tool steel, it can shear over 100 thousand times after each sharpening with the minimum burr. Â Shearing and hemming of the corrugated steel sheet can be done manually or automatically by feeding mechanism. The shearing and hemming of the corrugated steel sheet is hydraulically driven. Â The hydraulic system consists of oil tank, pump, motor and regulating valves for oil-ways. The main hydraulic elements are supplied by Rexroth Company, Germany. 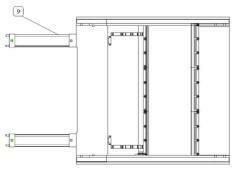 5.1 Electrical control system consists of main control cabinet, operation console, local operation panel and connection wires etc. All the relays, switches, transformers and PLC are mounted in the main control cabinet. Â MITSUBISHI controller have been adopted to fulfill the control of the production line. 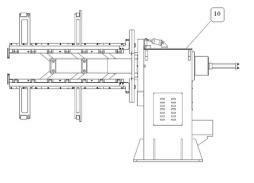 The sheet feeder and welding torch movement are controlled by MITSUBISHI AC Servo drive system. The SCHNEIDER Monitor has been introduced to the line as man-machine interface. The control console is equipped with the SCHNEIDER color touch screen, buttons, and indicating lights. Â The lamination shapes selection(like fin width, fin height and pitch) and parameters adjustment can be fulfilled easily through the SCHNEIDER color touch screen monitor. Automatic circulatory operation is fulfilled after the related parameters have been input. Local control panels equipped in different parts of the production line can realize manual operation. Â The transport rollers are used to convey the sheared and hemmed corrugated sheets to the welding device. Â The roller conveyor is equipped with ball bearing for flexible conveyance without motorization. Â The welding device is used to weld the corrugation ends edges and reinforcing rod with MAG welding mode and the diameter of round rod bar is 6mm~8mm. Â Â Â Â Â Â It consists of corrugated steel sheet conveying mechanism, welding torches elevating mechanism, amplitude modulation mechanism and one machine hand. Â 1) Corrugated steel sheet conveying mechanism: It can transport the corrugated steel sheet to the right welding position according to welding program. Â 2) Welding clamps and welding torches elevating mechanism: Each pair of welding clamps is driven by an air cylinder via link drive mechanism to hold and release the workpiece. The welding torches are mounted on slide which is driven by servo motor up and down along rolling guide via ball screw shaft. Â 3) Amplitude modulation mechanism: Two sets of welding clamps and welding torch moving mechanisms mounted on slide are arranged on both side of the line. Distance between the two slides is adjustable along the rolling guide with a centering lead screw. Â In case of missing seam welding, we use the machine hand to push corrugated fin to the welding position, and this machine hand is driven by air cylinder. Â This spot welding machine is used to increase the strength of reinforcement slots(embossment). Â 7) Air Source: Self provided. 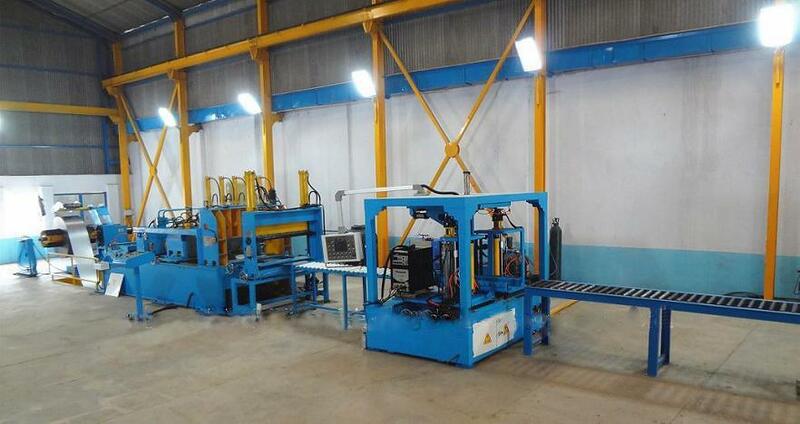 Â 9.1 This hydraulic vertical bending machine allows to form the 4 panels composing the complete transformer tank. Using this system it allows to eliminate 3 weldings, save time of assembling and welding the tank with a reduction of leakage risks. Â Â Â Â Â Tank assembly manipulator is designed for fast and easy assembly of the top frame, tank bottom and the four corrugated panels to make a complete tank.